Promotional Large Sign Kits - Our kits make advertising easy with our slogans to choose from. 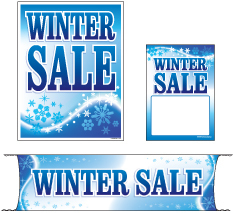 We designed most of our Posters, Banners, and Tags to be bundled into sale kits which includes two posters 38"x50", a banner 4'x20' and one pack of 5"x7" tags. These kits come in 3 sizes to accommodate most every store front. Save money by ordering a signage kit. Price is per kit. Use our line of feather and swoop flags with pennants to help promote your promotion. You save 20% buy buying a kit then by buying the items separately. Retail Merchandising Signs LLC kits are proudly manufactured by us in the USA. There are no price breaks on kits.